How Many Acorns Can a Woodpecker Store? 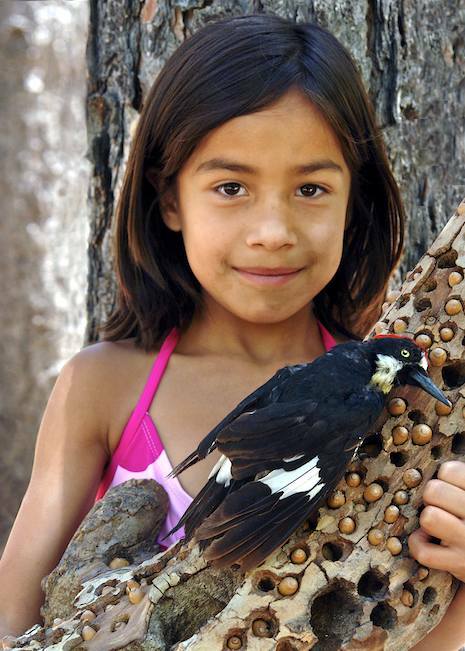 To a young girl named Yareli Vasquez of Fillmore the woodpecker was fun to look at and indeed was fascinating. It looked like the joker in the movie Batman. It wears a coat of black feathers with patches of white feathers, sports a mop of red feathers on its’ head and is the only species of woodpecker to have light colored eyes. She guessed there were 230 acorns stored in the tree section she is shown holding and won $10 at the contest held on last Saturday’s National Get Outdoors Day at the Wheeler Gorge Visitor Center. Yareli’s guess was the closest guess to the actual count of 221 acorns. To others the woodpeckers are pests, destroying telephone poles, fence posts, buildings and even radiators. When the Seabees pulled out the walls in the bathroom and kitchenette, large quantities of acorns rolled out and some were piled up in the fire stops in the wall. Acorn woodpeckers prefer dead sections of trees and softer pine trees to drill holes in creating a granary laden with up to 50,000 acorns. Wheeler Gorge has many oak and pine trees on the visitor center property and is home a variety of woodpeckers. They spend a great deal of time pecking away at trees creating storage for the acorns, digging out a hole to become a nest, or making a drumming noise on a tree as part of their communication with one another. They are gregarious and very noisy filling the air with their call of “jacka, jacka, jacka” or “waka, waka, waka” and other sounds. Acorn woodpeckers often live in large social groups referred to as “a bushel of woodpeckers. Our woodpecker came to the center on June 2, 2007 when a visitor said there was a small dead bird along highway 33 near our gate. I was amazed when I saw the little woodpecker up close and how beautiful and distinctive it looked. I decided at that moment to begin a bird collection and display for the visitor center. My mom loved birds and I decided in her memory to start with this woodpecker. I called officials and put in for a bird salvage permit through the U.S. Fish and Wildlife Service Department to be used for the visitor center. The Migratory Bird Treaty Act of 1918 “decreed that all migratory birds and their parts (including eggs, nests, and feathers) were fully protected. I am currently accepting birds from licensed wildlife rehabilitators only through my bird salvage permit. 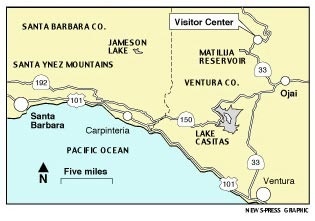 The Wheeler Gorge Visitor Center is located on Scenic Highway 33, a half-hour drive north of Ventura. The visitor center is operated under a special-use permit with Los Padres Forest Association and Los Padres National Forest. Wheeler Gorge is located 10 miles north of Ojai on Highway 33. Donations, used to pay for programs and advertising, are $3 for adults and $2 for participants ages 5 to 18; children younger than 4 are free. Seating is on a first-come, first-served basis. No pets allowed. Editor’s Note: Mike Havstad is the director of the Wheeler Gorge Visitor Center and is a Board member of Los Padres Forest Association. If you have an outdoor event you’d like publicized, an organization devoted to outdoor education you want featured or a story you’d like to share relating to the outdoors, email the Outdoor Guy at the Indy.